For many writers, confidence can sometimes seem in short supply. I’ve been a writer long enough and been around enough writers over the years to know that self-doubt is an undeniable part of the writer’s life. Perhaps it is not possible to be creative and never experience uncertainty about one’s work. I’d go so far as to say that if we never doubted ourselves, we would be the poorer for it. Brash, mindless confidence is worthless and doubt can be an essential tool that enables us to examine our creative work carefully, find what’s not working and make changes that move the work to the next level. But let’s be honest. We could all do with some of the energy that this little superhero in the photograph so clearly possesses. 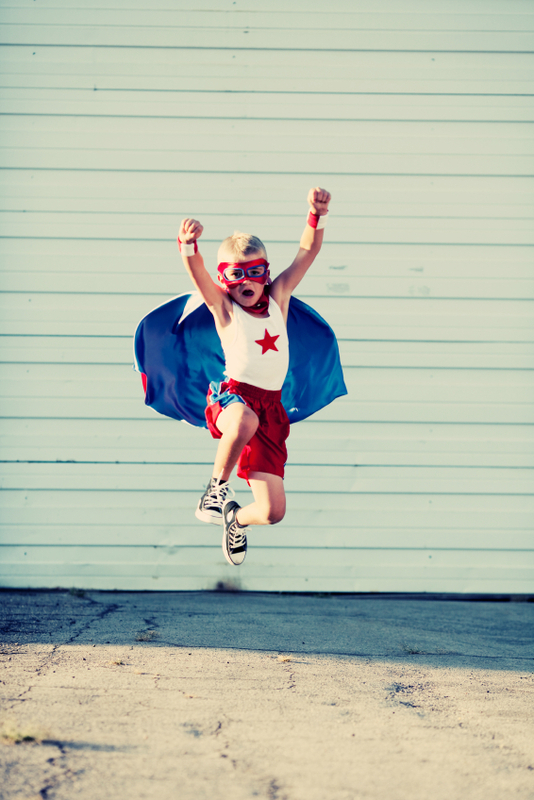 We could all benefit from such gusto and joyful certainty; every writer needs an inner superhero. So how can we cultivate such confidence? And how can we learn to differentiate between the kind of confidence that is good for our creative growth and the confidence that does us no good at all? Negative confidence is confidence born of arrogance; it is not built on a firm foundation of study, hard work, persistence, humility and talent. If I were to describe a writer in possession of ‘negative confidence’, I’d say it was one who believes they have talent but where that belief has no basis in any experience. The writer does not read widely; has never consulted his or her peers; writes an entire book without considering whether anyone might want to read it and markets that book brazenly, regardless of the fact that they haven’t even paused to get a copy-editor. Sometimes such writers prosper. More often, they trip over their capes. In my ebook Get Black on White: 30 Days to Productivity and Confidence for Writers, I elaborate on the subject of how you can get confident as a writer in the long term. But for those who are looking for a quick fix, I had a chat with my own inner superhero and asked her for just ten reasons why any writer can choose to be more positively confident – and why this would benefit a writer’s work, deepen its impact and allow us to live more sustainable and successful writing lives. Any writer can be confident when they decide that they will dedicate their creative energy to their craft in the long-term. We can be confident because we know that we are reading widely and constantly striving to be the best writer we can be. If we take a decision to question our work and employ self-doubt in a constructive way, rather than letting it eat us up, then we are also deciding that we are determined to be good at what we do. Once we take the decision to employ positive confidence, we also devote ourselves to constant improvement. We do what we need to do to consistently grow as a writer. We read books on craft and books that we aspire to write. We may attend writing classes or ask writing colleagues to give us constructive feedback on our work. We know that we haven’t ‘arrived’ yet, but we are confident in the process and the progress we are making. We can be confident when we cultivate a writing community. I know from experience how a writing community has helped to keep me buoyant when I might otherwise have succumbed to uncertainty and fear. Many fellow students on the creative writing MA at UEA kept me inspired at a time when I felt uncertain of my abilities. In later years, I found a group of fellow women writers who I’ve been meeting with on a regular basis for nearly ten years, sharing our work and the vagaries of the writing life. I’ve also seen how members of The Completion Club have supported each other through a writing year and I’ve seen the members’ work flourish as a result: two members have gained literary agents in the last few months! I have no doubt that the members would not have been so productive if it weren’t for that group support. We grow confident as we develop an understanding of the writing process. When we allow ourselves to fully understand and experience each step of the creative process – from how to write freely without fearing the blank page, to writing a very rough first draft, to developing our characters and plots, to refining that work through careful editing, to taking our work to the marketplace – then we know that at the end of this process, we will have produced a book that we are proud of and we know that we will find a place for it in the world. We can be confident because self-publishing is a more powerful tool than it has ever been. Even if our goal is to publish traditionally, the knowledge that the stigma of ‘vanity publishing’ is a thing of the past can be an enormous boost. We no longer have to rely on literary agents and traditional publishers to deliver our status as published author. This is not an excuse to produce substandard books! Rather, I believe it is our duty as authors, should we choose to self-publish, to prove to the literary establishment that self-published authors are every bit as good as traditionally published authors. So often, banal books make it through traditional publishing because the author has established a name or is already a celebrity or the book fits a convenient genre. That’s not to say that many amazing books aren’t being traditionally published. But good stuff gets missed. It doesn’t matter so much now. The author Barry Eisler turned down a $500,000 publishing deal in order to self-publish. Find out more about that story here or read a longer conversation about it on Joe Konrath’s blog here. Confidence comes when we write what we are passionate about. I learnt this one from hard experience. I once heard Martin Amis speak and he said that it is vital to “write from the throb”. Over the years, I’ve written books that have drawn me deeply into their world and I’ve also struggled with projects that have simply failed to keep me engaged because I was trying to write for a market rather than from my own fascination. My work has always been best when I’m in touch with that “throb”. I’d advise every writer to take this one seriously. Put your fascination first. Worry about genre later. Conversely, understanding the marketplace gives us an edge. This may seem like a kind of double-think, but my suggestion is that you practice market-awareness, even as you follow your throb. If you can at once write what you are passionate about and also gain an idea of how you will market that to a publisher, so much the better. Write what you are drawn to and then think about where it fits. 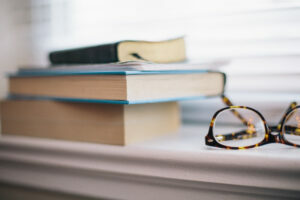 Study that marketplace too, so that you gain a clear sense of how your book can be seen to appeal to a market – yet also, how it has a unique quality that no other book in that genre possesses. Be confident because it’s the responsibility of every creative person to prove that the myth of the doomed artist is just that, a myth. I wrote about Creativity and Despair in an article on the work of playwright Sarah Kane and in my own novel Bluethroat Morning (Bloomsbury paperbacks). Even Plath wrote: “The worst enemy to creativity is self-doubt.” When you choose positive confidence (like the little fellow in the photo), you gain access to your most brilliant self. In a confident state, we produce our best, most insightful work. We owe that to ourselves and to our readers. I would love to hear your experience of how being confident has affected your creative life and your reflections on the role of confidence in creativity. Do feel free to share your thoughts by commenting. I was very interested to read this. It triggered several notions for me. One was Malcolm Gladwell’s idea that a talent for something is latent until it is practiced: he estimated that it takes 10,000 hours of practice to become expert. That’s 20 hours a week for ten years. Famous examples: David Beckham who dedicated himself, from the age of 9 years, to the development of his talent (some say his talent was modest, but he was driven by passion) to become the world class player he remains today. Or the Beatles, who practiced in the clubs of Hamburg for many years before they became the pop phenomena of all time. A stark contrast to these examples is in today’s Press. Sally Bercow, an MP, has written her first novel, taking the opportunity of some recent risque press attention to carve out a new career for herself. She has an agent, but as yet, no publisher. For the hard-working, hard learning writers amongst us, it can be hard to see celebrities (examples: Alistair Campbell; any member of the Loose Women panel) treating “writing a book” as some kind of brand extension that requires little in the way of hard work – what are ghost writers for, after all? Writing is a lot like cooking: we can all do it to at least a functional standard, and some of us can get quite fancy on special occasions. Nearly everyone can write; that doesn’t mean they can write a good novel, necessarily. I love the story, maybe apocryphal, about Margaret Atwood, before she was famous. Asked, at a dinner party, what she did, she replied that she was an author. Faced with the reply: ah, yes, I’m going to write a book when I retire, she responded: really? When I retire I’m going to be a brain surgeon…. Margaret Atwood’s words are just brilliant. Both she and her dinner companion were obviously planning a very long retirement! I find that I’m learning more with each book that I write and it is humbling sometimes to discover that each book presents an entirely new challenge. The oddity about confidence is that while the quality of our work is improving we may be convinced it is decreasing. Our growing sophistication as connoisseurs may sometimes leap so far ahead of our productive skills that we are gripped in an Escher-like illusion so discouraging that even a double scoop of Belgian Chocolate Häagen-Dazs offers no alleviation. The time lag between our growing awareness of the qualities of great writing and our ability to embed them into our own work all too often feels like an aeon — but if we are patient and soldier on we can be reassured that our skills will ripen. My favorite vision about literary confidence comes from the mind of David Morell, “On every page, confidence fights with self-doubt. Every sentence is an act of faith.” You can see the band of crusading knights laying down their lances to pick up sharpened quills. Can any storyteller resist such a rousing call to conquer their self-doubt? I think you’re absolutely right here Tony. I often find that it is the most talented of my clients who doubt themselves the most and I’m constantly amazed at how many truly gifted people are so uncertain of themselves and their abilities. Conversely, it is often those who are the most arrogant who have the furthest to go. Rough bones can make a delicious stock. Best wishes with the new project Jacqui. how do you continue when the comtent of so called book to be, is of an unpleasant personal nature and not an overall comforting subject.On the positive, it would benefit others. In my view, I’d say, think carefully about why you want to write this book. Journal around that question. What are the reasons why I want to write this? Do I really want to? Is there a good reason for not writing the book? If so, would I feel happy just walking away? If there are some really positive reasons that outweigh the negative, then journal around what the positive messages are? How CAN I inject this positivity into my message, even if the subject matter is harrowing. That doesn’t mean lighten it or don’t take it seriously, but rather be aware of a the positive reasons behind the work. Find a way of working that makes it easier for you – write in a beautiful place or with a strong sense of purpose that keeps you centred. I don’t say it’s easy, only that if you are to write it, you need to come from a sense of knowing why and from immersing yourself in the material. Perhaps the involvement itself can be cathartic in some way? Hope there is something helpful here. Hi Jacqui, long time no hear; I’m still writing everyday almost and enjoy every minute of it. On reading the comments- I say to myself there’s not much hope of me publishing, I’m an ordinary person with an ordinary brain and when I read some of the comments they fill me with prograstination. They scare me half to death because I am putting so much time and effort into my book that I wonder will it ever be published. Then I ask myself what if it’s not published?, at the minute my whole life is worked around my writing and I know I have a good story but the comments and your answers scare me. I can’t think of doing anything else now but WRITING and having my book almost finished, 17 complete chapters now including the last one, just connecting the plots and subplots now and filling in gaps which will undoubtedly end up being more chapters. I know I must join your “Completion Club” soon to get that extra support you talk about and I will, I will really I will – soon! I promise. Love to hear from you again. PS. I thought I had signed up for the weekly motivation emails. Evelyn. Just to let you know that the newsletter has been on hold and is undergoing a redesign. It will launch in the next few weeks and I hope it will be fortnightly. All writers worry about whether their work will be published or not. I think the most important thing when one is in the early stages of a prospective writing career is to focus on the pleasure of it. So many writers have unpublished novels that they wrote in order to learn their craft. And of course, some first novels break through straight away. I’d say that it must be done for love first, as it is indeed a potentially long apprenticeship. For example, right now I’m taking acting classes. I love it, but I’m not worrying about whether I’ll ever become an actress or get a part in a play. I just want to be as good as I can be. Take it seriously I’d say, but also do it because you love it, you love your world. That will shine through.